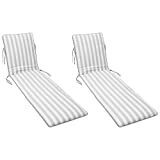 Are you after some great quality sun lounger cushions to help you relax in the sun? 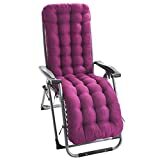 You will have to consider the type of your sun lounger together with the weather conditions when picking your cushions, as some sun lounger cushion types such as leather and PVC made cushions tend to be appropriate for winter and rainy seasons whereas fabric etc cushions are ideal for the sunny weather. Also, some sun lounger cushions may be available with their respective covers to make them ideal and good for all weather conditions. Sunlounger cushions bring summer fun and relaxation to mind right away. When you think about a fun and relaxing time, lounging in the sun is likely one of the very first things that you think of. Nothing is more peaceful than lying in the sun with a good book, a cool drink, a snack and a pair of sunglasses. Of course, to make this time as comfortable and tranquil as possible, the perfect sun lounger along with the most comfortable cushion would be of the utmost importance. Wipe Clean, Can Be Used On Its Own In Gardens, On Floors Or At The Beach. Size:170 * 53 * 7 cm, Lengthening design suitable for most sun loungers. A chair cover is added to the top of the cushion to prevent the cushion from sliding down; with 6 pair bands for fixing the recliner. Thick sun lounger cushion made from cotton and fiber. Available in 12 Great Colours, (new colour for Spring 2018). There is a colour for Everyone. The New Grade Sun Lounger Cushion is a more thicker and longer comfortable garden chair pad made to fit sun lounger frames. Non-Slip Top Cover:The premium lounger cushion has a cover to the top and 6 pairs bands which ties to the side to help secure it to your chair frame, ensuring it doesn't slip during use. A mat made of pearl cotton and fiber. The rebound effect is good, not easy to deform, comfortable and breathable. For vacuum compression packaging, place the recliner cushion in the sun to restore the fluffy shape. 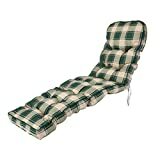 Size: 170 * 53 * 7 cm, More Longer suitable for most high back sun loungers or recliner. When selecting the perfect sun lounger cushions, there are several things to consider. First, and most importantly of course, is the level of comfort. If you purchase an uncomfortable sun lounger cushion, you will not enjoy your time in the sun and you will not achieve that level of tranquility you were hoping for. 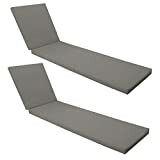 Many sun lounger cushions are so thin that you can feel every bump of the lounger underneath. Others may be made of poor quality fabric or filler material so that the cushion feels irritating to you. Therefore, it is important to select a cushion that not only feels comfortable to the touch but also provides you with the correct level of firmness that feels most restful and comfy to you. Some people prefer a sun lounger cushion that is very firm, providing support to the back. Others prefer a sun lounger cushion that is soft and almost cloud-like. This is completely a matter of personal preference, so shop around to find out what will be our perfect cushion. Another consideration is style. Sun lounger cushions come in such a large variety of patterns and fabrics that you can find almost anything you can dream up. Are you looking for something serene that will blend in with a natural setting? Perhaps you are looking for a traditional pattern, such as a stripe, or a plaid. A tropical or floral pattern is another popular choice for sunbathers looking to add a fun element to their back-yard décor. Many customers prefer a simple design for their sun loungers and cushions, like a geometric pattern. If you are looking for a versatile choice, you could select a solid color which will never go out of style and will add an element of understated elegance to your private oasis. It is always a good idea to look at the care tags for sun lounger cushions. Many models are very easy to care for and simply need rinsing off every now and then. Other models may require a bit more maintenance, like machine washing. Some sun lounger cushions can stay on your lounger in the case of rain, while others should be removed to keep them dry and in tip-top condition. This matter of maintenance is again a personal preference. After making each of these decisions, it is finally time to do what you set out to do in the first place: enjoy the sun! Get yourself a good book or a pair of headphones and head out into the sunshine while you enjoy your new sun lounger cushions. Don’t forget the sunscreen! Garden chair cushions go along perfectly with your garden chairs and sets. When picking a cushion for your garden chairs, you have to consider certain factors which include your garden type and whether your garden chair will stay indoors or outdoors. 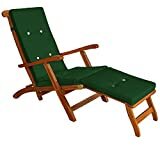 Your area weather conditions would also contribute to your selection process so go for a garden chair cushion that would be ideal for your area. Sun loungers are referred to by different names and terms depending upon where you may be from, however, the most popular words used are sun loungers, sun beds, outdoor recliners etc. 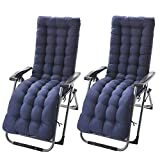 So, when looking for sun lounger cushions, you will need to be aware of these lest you should miss out on certain better quality lounger cushions. Regardless of which store you visit for sun lounger cushions, there will always be this feeling of not getting to pick from a good enough variety which is the main reason buyers often resort to the internet to make it easier to find their cushions of choice. Local stores would only have a very limited variety available unless all they do is sell cushions for loungers and sunbeds and this is not a common thing to find. Although the list of sun lounger cushions provided above lists bestsellers, you may not necessarily be able to find something that you might actually be looking for.